Found – the perfect London museum for older kids looking for something beyond the much-loved but well-worn round of Science and Natural History Museums. 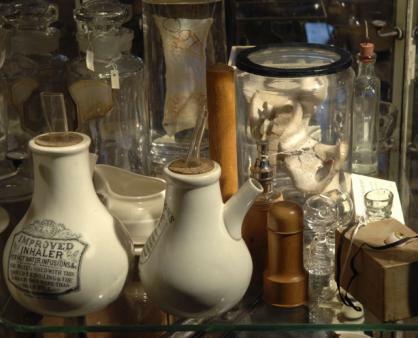 A dip into the history of all things surgical, the Old Operating Theatre Museum is a hidden scientific gem in a historic corner of the capital which will keep inquisitive minds entertained for hours. Packed with enough gory historical surgical equipment and detail to spark the imagination of the most blood-and-guts-obsessed boys, the Old Operating Theatre and Herb Garret offers a glimpse into the life-saving operations of the past. Dominique Dinse visited with Oliver, 10, and Ben, 9. Tucked round the corner from London Bridge Station is a beautifully preserved baroque church bell tower housing the oldest operating theatre in Europe. Not as random a location as you might think, as some of the old St Thomas’s Hospital buildings were built around the hospital church in 1703 by Thomas Cartwright, master mason to Christopher Wren who was at that time a hospital governor. The bell tower houses the 1703 herb garret, used by the hospital’s apothecary to store and cure herbs used in medical compounds, as well as the the only 19th-century operating theatre to have escaped demolition or conversion – all the more remarkable considering the scale of development in this historic precinct: the church tower sits in the shadow of The Shard. 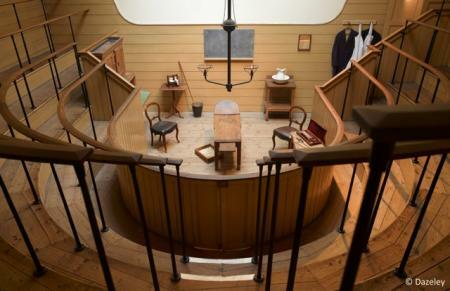 The old operating theatre was originally built for women patients from the adjoining surgical block and is truly historic in that it was used in the days before antiseptic and anaesthetic surgery. Florence Nightingale established her nursing school here in 1860 and this building also witnessed the advent of anaesthesia in 1846. The church was part of old St Thomas’s Hospital until it was closed for relocation to Lambeth in 1862 and the attic remained completely hidden for nearly 100 years until its rediscovery in 1956. The displays here are mostly aimed at adults and older children, so if you only have very little ones, a more sensible option would be nearby attractions such as the Golden Hinde or the Tate Modern. 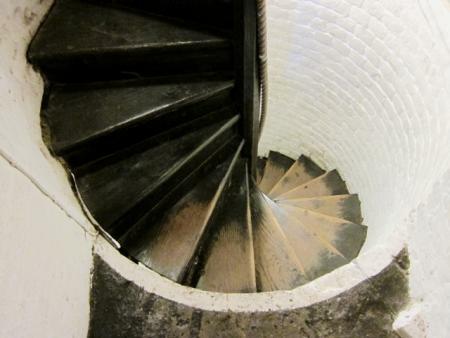 There are 32 tiny spiral stairs leading up to the attic exhibition space, so buggies are out, too. That said, medical-themed toys and books have been thoughtfully placed in a quiet corner so little ones can still have fun playing dress-up in doctors’ coats and stethoscopes and leafing through picture books while their bigger siblings look around. While all the actual medical paraphernalia is, sensibly, behind glass, there’s lots of hands-on fun for early learners. A colourful mobile showing all the different components of blood dangles from the ceiling and there are baskets of medicinal herbs to handle and sniff, with handwritten labels explaining what they were used for. Intriguing looking models of the human body – everything from a 3D jigsaw of internal organs to a larger-than-life model of the human heart and lifesize skeleton – are set out at low level, next to bones, skulls, shells and other bits and pieces, all just begging for little hands to pick up and investigate. 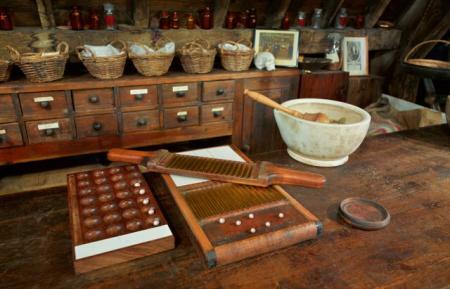 A favourite with our boys was the antique “pill machine” which let us roll out and cut plasticine into “pills”, just as the hospital apothecary did here 250 years ago. Finally, there are kidney bowls full of coloured pencils and children’s scissors and pins next to a paper model of a skeleton to cut out, put together and take away with you as a souvenir. Older children will love the displays of macabre-looking surgical instruments used in actual operations during the hospital’s heyday – rows and rows of businesslike knives, scalpels, saws, retractors, anesthetic equipment and even leech jars, all set out in glass cabinets with helpful labels explaining what they were used for. Nursing, pathology and anaesthetics are all covered here – and there are modern pamphlets very helpfully scattered about from the hospital next door for young minds sparked into exploring any of these further as a career. The operating theatre downstairs is the main attraction and it’s well worth the trip. 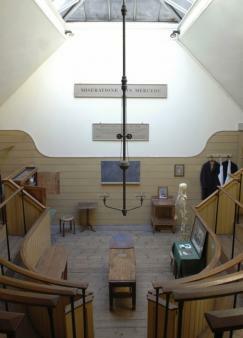 An original 1830s wooden operating table sits in the centre of the room, surrounded by rows of standing spectator space. Here, real-life operations were once carried out and eminent surgeons lectured eager students as they delved and prodded. Information trails for both children and adults, cleverly put together to help you make your way around the displays, with clearly set-out symbols that match questions on each sheet. Choose from surgical, pathology and anatomical themes. Our favourite was The Apothecary Assistant – we had to imagine we were assistants of the apothecary working at St Thomas’s in 1825 and had four patients, all with different medical conditions to cure. By using the cards displayed among the collections of herbs, we had to try to discover the best remedy for each case. Show your completed questionnaire to the staff in the shop at the end and you get a certificate to take away with you. There are no family events as such, but the museum hosts brilliant events and evening talks which some older children will love. Recent highlights have included Artist and Anatomist by renowned heart surgeon Professor Harold Ellis; Death of a King, discussing the discovery of Richard III’s remains in a Leicester car park in 2012 and what a modern post mortem might tell us about how he lived and died; and even Night of the Bodysnatcher – a talk in the darkened Old Operating Theatre on the gruesome profession of the men who supplied the dissecting rooms of London from the graves of the city, the tricks of their trade and the stories of their gruesome work. Not surprisingly, the talks contain graphic content and are recommended for children over 7 years. Booking for these is essential, particularly in the holidays, as the museum is very small, with a maximum capacity of 60. The museum is so tiny that it has no café or even toilets. However, St Thomas’s Street has a range of family-friendly restaurants and cafés including Starbucks. The Shard has a lovely light, airy café/bar with an entrance on St Thomas’s Street if you’re looking for something a bit more upmarket and nearby Borough Market also has a range of fresh food for the whole family. The Museum is 2 minutes’ walk from London Bridge Underground and rail station and a few minutes’ walk from the rebuilt Globe Theatre, Tower Bridge, HMS Belfast, Clink Prison and other Southwark attractions. Visiting Bankside is a relatively stress-free with kids as the attractions are so well signposted. Tickets for the Old Operating Theatre Museum are £6.50 adults; £5 concession; children under 16 £3.50; family (up to 2 adults and 4 children from same family) £13.90. National Trust members receive a 50 per cent discount on admission on presentation of their valid membership card. The Old Operating Theatre Museum is open from 10.30am to 5pm every day, including bank holidays except Christmas Day and Boxing Day. It is closed over Christmas from 15 December to 5 January. The shop is a treasure trove of themed bits and pieces for as little as 50p. Books, toys, stickers, action figures… root around in this minuscule corner of the attic that doubles as the entrance desk and you never know what you might find. Favourites with us were syringe-shaped pens (complete with fake blood inside) for £1.99 and key rings (£1.25), book marks (£1.75) and pin badges (£1.99), all inscribed with the name of the museum. There are also soft microbe educational toys – making this, quite possibly, the only place in London where you can buy a fluffy toy in the shape of germs and bacteria including mad cow disease, MRSA and even the common cold, from £2.99 to £6.99. The website is also an educational treasure trove. There’s a downloadable teacher pack to prompt classroom discussions with links to other websites of interest to medical history; links to interactive games and science-themed websites for kids; virtual tours of the museum, showing the operating theatre and garret displays with 360-degree photos and various educational packs put together by the museum to download either for free or for a small fee. Well worth a visit.